Wound , Twisted , Tied , Stitched ? L = 230 mm, W = 69.5 mm, th = 55 mm (at top), diam cord = 1.5 mm [RTS 1/12/2004]. Purchased by Brian John Mack (known as John Mack) (then at the Museum of Mankind) for 50 piastres on 19th February 1979 as part of the British Institute in East Africa's expedition to the Southern Sudan, headed by Patti Langton [RTS 14/6/2004]. Tassel for decorating the horns of a favourite bull, and consisting of a strip of skin taken from under the throat of a ram, with the long thin black hair still attached to the outer surface (Pantone black 7C). This has been wound into a tight spiral, so that the hair hangs down the outside in a thick tuft that tapers to its base. There is a small patch of white hair inside the tuft. A length of twisted plant fibre cord, made of 6 strands, has been passed through the centre of the tassel, and knotted on its underside; this projects through the top as two separate cords which are knotted together at the top, forming a loop from which the object can be hung. This cord is a pale yellowish brown in colour (Pantone 7506C), is very woolly in texture and may be imported European cotton. There may also be some string stitching inside the tassel to help it keep its shape, and thin rectangular hide strips are also visible, although it is not clear if these are part of the hide and hair body piece or additional to it. The tassel appears to be nearly complete, with some broken hairs near the top, and has a weight of 54.8 grams. It is 230 mm long, 69.5 mm wide at the top and 55 mm thick. The cord has a diameter of 1.5 mm. Purchased by Brian John Mack (known as John Mack) for 50 piastres on 19th February 1979, as part of the British Institute in East Africa's expedition to the Southern Sudan, directed by Patti Langton. The exact place of collection was not specified, but it probably came from Dhangrial, Wun Rog, or Mayen, all of which lie within the modern administrative district of Northern Bahr el Ghazal. For a map showing the distribution of Dinka Tuich groups, see J. Ryle, 1982, Warriors of the White Nile: The Dinka , p. 25. Sheep-hair ornament, called poot amal; t hese are hung from the horns of a favourite ox for decoration. They can be either black or white and are hung on an ox of the opposite colour. Nebel defines this term as ‘Amaal, pl. amèl, sheep. (A. Nebel 1979, Dinka-English Dictionary, p. 9); no match was found for the word poot. Accession Book Entry [p. 185] - 1979.20 (.1 - 206) P[urchase] MISS PATTI LANGTON, DEPT. of ETHNOLOGY & PREHISTORY, OXFORD. Collection made by Patti Langton during the British Institute in East Africa's expedition to the Southern Sudan; Jan. - April 1979. The collection was made in three culture areas during the dry season. The amount paid for each object is listed if the information is known. In Jan. 1979 £1 is equivalent to 95 piastres (pt.) Sudanese. This documentation is based largely upon Patti's own list of objects and her notes on these. Sometimes objects included in the Pitt Rivers alottment of the collection do not appear on her list and have been added here. See Related Documents file as well. [p. 191] 1979.20.43-135 SOUTHERN SUDAN the DINKA TUICH. The Dinka Tuich, a pastoral people, live to the north of Wau, in Bahr el Ghazal province. This collection was made mostly at Dhangrial, the archaeological site at which we camped. Other artifacts were collected either at Wun Rog, a small town about a mile south of Dhangrial, or at Mayen, the new administrative centre 12 miles north. This was a remote area, difficult of access and rarely visited by outsiders. The Dinka are very aware of the potential of money, which is used either to help family members acquire education or entry into commerce and administration in Juba or Khartoum. Once it was known we [insert] (the collectors) [end insert] were offering money, the Dinka in surrounding compounds came daily, increasing prices as often as they could! [p. 195] 1979.20.74 Sheep-hair ornament, poot amal . Made from the skin of a ram, cut from under its throat. These are hung from the horns of a favorite [sic] bull for decoration, when staying with the bull. Poot can be black or white, pinned on a bull with the opposite color [sic]. Coll. by J. Mack, 19.2.79; 50 pt. Coll. no. 174. Additional Accession Book Entry [below accession number in red biro] - A5-F34-33. Card Catalogue Entry - There is no further information on the catalogue card [RTS 19/2/2004]. Related Documents File - 1979.20 contains a typed packing list, which has been annotated; a typed list of objects arranged by Langton collection numbers and with pencil and biro annotations, and a handwritten list of objects by museum number, essentially repeating this information and annotated with PRM photo numbers in red. This handwritten list seems to be the direct source for the accession book entry [RTS 12/1/2004]. Current display label - SUDAN, BAHR EL GHAZAL; DINKA. 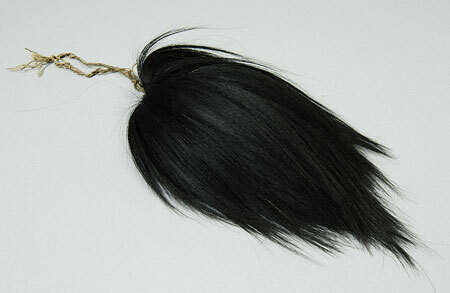 Sheep-hair ornament, poot amal, made from the skin of ram cut from under its throat. These are hung from the horns of a favourite ox for decoration. They can be either black or white and are hung on an ox of the opposite colour. Collected by J. Mack and purchased from P. Langton. 1979.20.74 [in case U.26.A; RTS 13/12/2004]. Sparks, Rachael. "Dinka Tuich bull tassel" Southern Sudan Project (in development). 03 Jan. 2006. Pitt Rivers Museum. <http://southernsudan.prm.ox.ac.uk/details/1979.20.74/>.